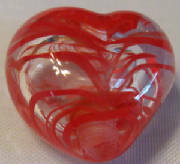 Lavender Hearts- A set of 6 beads consisting of a heart shaped focal bead with a pink flower. 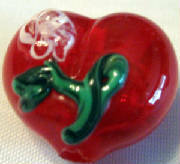 Also are 2 smaller heart beads with a simple pink bud. 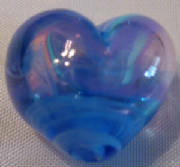 Three plain lavender hearts are included. Price: $14 for the set of 6 beads. Orange Flowers: A set of 3 focal beads with two small filler beads. 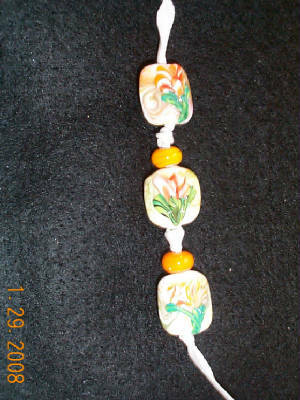 Delicate orange and white flowers in a tab shape beads. The flowers are on both sides of the bead. These would be great for a pair of earrings and a pendant. That's entirely up to you! The background is a delicate mixture of pastel watercolor swirls. 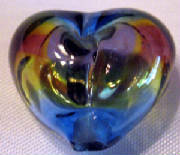 Price: $10.00 for the set of 5 beads.